The Texas-born, New York-based tenor saxophonist Stan Killian is the latest in a long line of saxophonists blessed with the legendary “Texas Tenor” sound – from Arnett Cobb and James Clay to Wilton Felder and Illinois Jacquet; all master hornsmen who played with a big-toned, bravura sound of wide open spaces that covers the blues, the bayou, bop, the past, and the present. It’s been said that they do everything big in Texas and the evolution of Stan Killian’s career confirms that old saying. Born in 1978, Killian’s professional career started when he was sixteen, gigging with his father Joe Killian in the San Antonio area. His father worked in the bands of Texas tenor greats Don Wilkerson, Clifford Scott and Jimmy Ford. 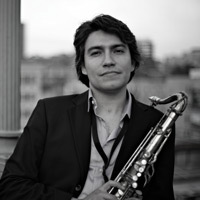 Stan Killian, inspired by the tenor sounds of Coleman Hawkins, Ben Webster, Dexter Gordon, Sonny Stitt, and Johnny Griffin, graduated from high school in 1997 and then attended Texas State University in San Marcos, where he studied saxophone and improvisation with teachers John Mills and James Polk (former arranger and composer for the Ray Charles Orchestra). Killian later free-lanced in the Austin music scene, performed as a side-musician with various local bands, and after his twenty first birthday, Killian recorded his first CD, Straight Ahead which featured Austin trumpet legend Martin Banks. Killian then moved to Houston to lead his own group and work with guitarist Clayton Dyess, who had performed with Nat Adderley, Dizzy Gillespie, Arnett Cobb, and Joe Pass. In 2002, Killian recorded his sophomore CD, Deep Down, which featured Dyess, Joe Killian, and Houston drum legend G.T Hogan. Stan’s playing during this period, especially his consistent emphasis on tone, reflects his early influences, the full-bodied tenor sounds of Coleman Hawkins and Ben Webster. It was also in Houston where he became a founding member of the jazz-Brazilian group, Com Voce. In 2006, he moved to the East Coast and immediately became a top call saxophonist in the bustling Baltimore and Washington, DC jazz scenes. While in the Mid Atlantic area, he studied with modern jazz masters Gary Thomas and Larry Willis. But after several successful shows in New York City, he decided to move to the Big Apple to perform original music with like-minded, creative musicians. Killian's "Unified" Reviewed in Jazz News! Stan Killian's "Unified" was reviewed in the January/February issue of Jazz News (France). Nice review of Killian's "Evoke" in DownBeat! Nice review of Stan Killian's "Evoke" in the July 2013 issue of DownBeat! Very nice review of Stan Killian's "Evoke" in the Summer 2013 issue of Jazziz!